Odds are good that if you live in the area, you've walked by the the closed Williamsburgh Savings Bank and wondered what's inside. Located just over the Williamsburg Bridge, at 175 Broadway, in Brooklyn, New York, the Beaux-Arts sty building hails from a time when banks were grand, church-like spaces. And now, after years of deterioration, the space is finally being restored—as a social hub intended for the burgeoning community that is Williamsburg. I paid a visit to the in-progress renovation recently, and was able to snap a visual tour of the proceedings. Entering through the basement of the bank, I walked through an area where the crew is taking old doors, molding, and other bits of the structure to either restore or recreate and replace if too damaged. Once the restoration process is finished, the basement will become a loft space for parties. There's an old-timey elevator that is one of only three unmodified "bird cage" style elevators in all of New York City. Having been first installed in 1911, it was overhauled during the restoration for guest use once Weylin B Seymour's opens. The main hall is a combination of two gorgeous open rooms divided by an archway that, when the bank was purchased for renovation, was covered with sheetrock. One room was filled up entirely with trash and the flooring of both rooms was largely unusable. Instead of getting rid of the old flooring entirely, salvageable parts were cut out to be installed in the bathrooms. That means the bathrooms have the original flooring, dating all the way back to 1875. The main space will have all brand-new tile, though it's designed to look the same as the older version. The hall is filled with natural light, thanks to the oval windows around the dome. 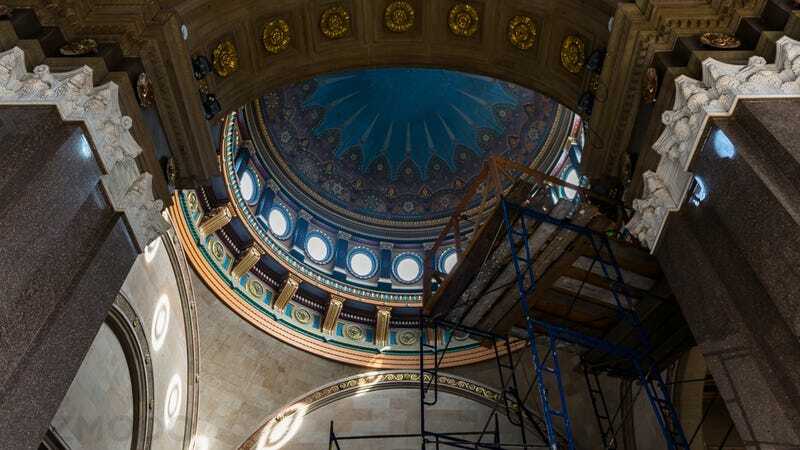 The dome showcases the only surviving mural by Peter B. Wight, the architect responsible for the bank, as well as many other famous New York buildings of his time. To restore the dome, it underwent many of the same processes the Kings Theater is currently undergoing to bring its own intricate ceiling back to life. Some rooms in the bank are white walled and beige ceilinged, ready to be covered with era-accurate wallpaper and paint. Decorating many of the walls are antique mirrors, which maintain the 1870s aesthetic that made this space so grand during its heyday. Even the bank's vault has been turned into an a lounge-like room for visitors to enjoy. Inside, you'll be able to look at the inner-workings of the vault door. The exposed gears and levers accompanying a Napoleonic coin make for an incredible sight. Unfortunately, when I visited, the front of the vault door was covered for protection. One of the building's most beautiful accents are the doors' individual hinges. Though many are just replicas, some were found damaged on site and restored to be reused.